"These beans are cold-pickled rather than canned. Crispy and delicious, the pickled beans will stay fresh for several months as long as they're kept cold -- if they last that long!" 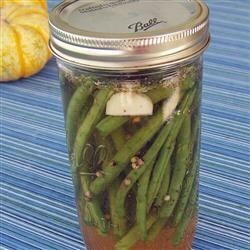 I agree, they are a little bland (though the pickling vinegar would make a great salad dressing) - and I think it would be better to blanch the green beans first. Made these just as recommended and loved them! I did need more of the vinegar and water mixture than the recipe called for, though. Super easy and I will definitely make more. Must have done something wrong, Awful!